You understand that Assembly funding and, to a large extent County Council funding, depend on Westminster, and only a Labour Government can deliver for Llanelli. Liam Byrne MP, Alistair Darling's right-hand man, has agreed that we need to revise the Barnett funding formula to deliver a better deal for Wales. But only a Labour Government in Westminster can actually deliver that money for Wales. ... I'm counting on you to help me get the best deal for the people of the Llanelli constituency. So let's have a look at those claims in a little more detail. Let's look at what the Labour Government in Westminster has actually delivered for Wales in their thirteen years in power. This is a chart showing how spending in Wales relative to the remainder of the UK has fallen, taken from the Holtham Commission's report on finance and funding for Wales. We can see that Wales is now much worse off compared with the other countries of the UK than it was when Labour came to power. So Labour's claim to be the only party that can actually deliver money for Wales is nothing other than a barefaced lie. Precisely the opposite is true. What has happened is this: Labour have spent a lot of money on the UK as a whole, and a lot of that money has been spent in Wales. The problem for us is that Labour were increasing their spending more per head in England and Scotland than they were doing in Wales. Yet Labour expect us to be grateful to them because we have received half a share, rather than a fair share. They rely on the fact that people in Wales won't look beyond the immediate horizon to see the bigger picture. 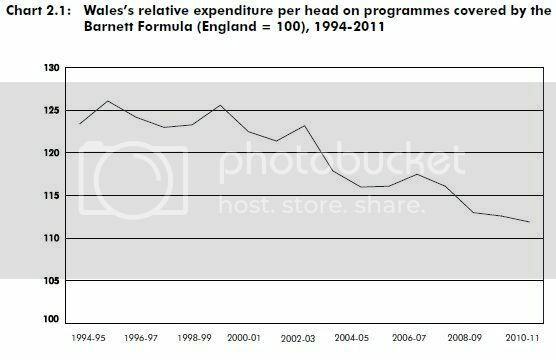 As we can see from this table, the PESA figures show that over the past six years relative spending (the UK as a whole is 100) in Wales has gone down from 114 in 2002-03 to 110 in 2007-08. But for the same period relative spending in Scotland has in fact gone up from 117 to 118, and in England from 96 to 97. So why has this happened? It is simply because Labour Secretaries of State for Wales have not taken the same care to fight for Wales as their counterparts in Scotland, or the departmental Secretaries for England. But the real scandal is that Labour won't do anything to change this unfair situation. Why do you think the letter mentions Liam Byrne rather than his boss Alistair Darling on one hand, or Peter Hain on the other? Simple, it's because Alistair Darling has refused to make any commitment to change things ... and that Peter Hain, rather than fight for Wales, prefers to take this snub and spin it into something else. But it was nothing of the sort. Hain was lying through his teeth. All he got was from the Treasury was the non-committal statement that everything to do with funding for Wales was essentially all right, that it always has been, and that nothing is going to change ... but that they might look at it in future if things get worse. So instead of actually fighting to "actually deliver that money for Wales" Labour meekly gave up the fight without winning any commitment from the Treasury other than to "look at it". 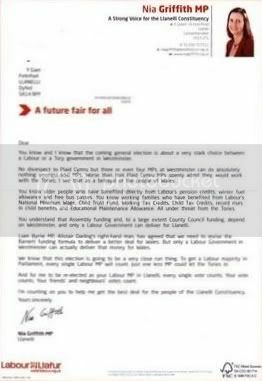 So why the hell should anyone in Llanelli actually vote Labour? In the thirteen years that Labour has been in power their track record has been precisely the opposite of what they claim. And as for Nia Griffith herself? Yes, she probably does care about her constituents, I don't doubt that. But the real question is whether she has been able to make any difference for them in Westminster. Like so many Labour MPs, she's fine at standing up for things like keeping post offices open when she's in the constituency, but in Westminster she will do what the Labour whips tell her to do ... and vote to close them. That's just one example of why what it says in her letter about a Labour MP being able to make a difference is so pathetic. Most Welsh Labour MPs are just lobby fodder to vote through what the Labour government in Westminster decides. 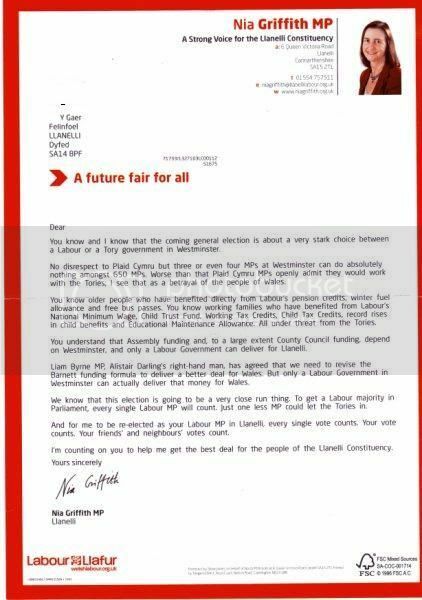 But Llanelli has a far better choice than to vote for Nia Griffith. Llanelli is going to be a contest between Plaid Cymru and Labour and I can guarantee that Plaid's Myfanwy Davies will stand up and fight for Llanelli and for Wales, rather than meekly turn into lobby fodder for the issues that matter to middle England. It's a big ask, but she can do it. Labour's share of the vote in the 2005 election was 46.9% with Plaid at 26.5%. So it would take a straight swing of just over 10% for us to win. But that's quite close enough to mean that many of those who voted LibDem and Tory (12.9% and 13.7% respectively) will turn to Plaid simply in order to break Labour's hold on the seat. Only by voting for Myfanwy will people in Llanelli be able to get rid of a Labour Party that does precisely the opposite of what it claims to do for Wales, and a candidate who isn't strong enough to stand up for her constituents when the Labour whips in Westminster tell her to do the opposite of what she told them she would do. I think Llanelli is going to Plaid this year - although it'll be very close, probably within 1000 votes either way. I think it's more likely than either Aberconwy or Ynys Môn at any rate. 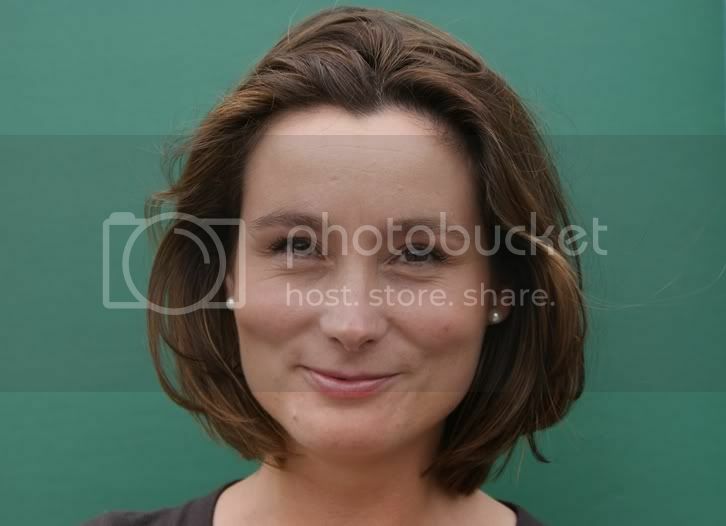 There are two things I don't like about Nia Griffiths: her face.